Tracheal intubation under deep inhalational anaesthesia is a common practice in paediatrics; however, since the introduction of short-acting opioids, intubation has become more successful when these drugs are used in combination with propofol, avoiding the use of neuromuscular blocking agents with their unwanted side effects. Several techniques and adjuvants have been used to improve intubating conditions. We studied the interaction between magnesium sulphate and the anaesthetic agent's propofol and fentanyl to facilitate intubation in paediatrics. A total of 40 preschool and school-aged patients scheduled for short urogenital procedures were randomly assigned in a double-blind study to be administered either a 5-min infusion of magnesium sulphate (30 mg/kg) in 0.9% saline 5 ml/kg (magnesium group, n = 20), or the same volume of saline (control group, n = 20). Anaesthesia was induced (1 μg/kg) fentanyl followed by propofol (2.5 mg/kg). 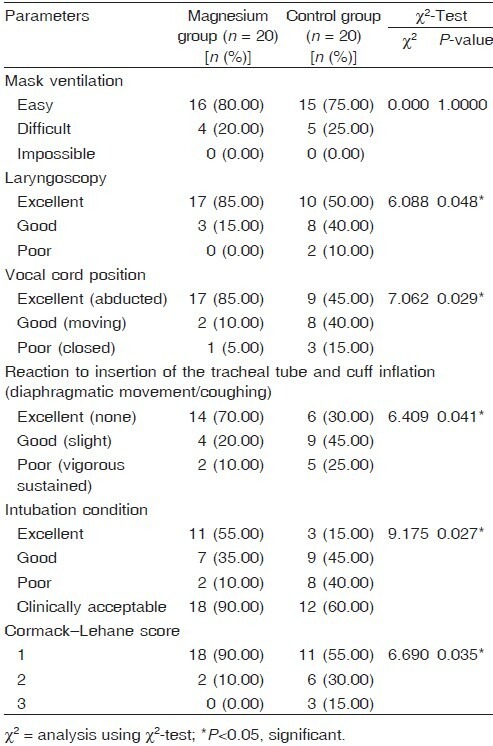 Intubating conditions were assessed by Copenhagen score. Blood pressure, heart rate, respiratory rate and EtCO 2 were recorded. Serum magnesium was measured, and Aldrete recovery score was assessed. The two groups were comparable regarding demographic data. Intubating conditions were better in the magnesium group than in the control group (0 vs. 60%). There were no differences between both groups regarding haemodynamic variables. The duration of intubation was insignificantly shorter in the magnesium group. Aldrete recovery score showed no difference between both groups. 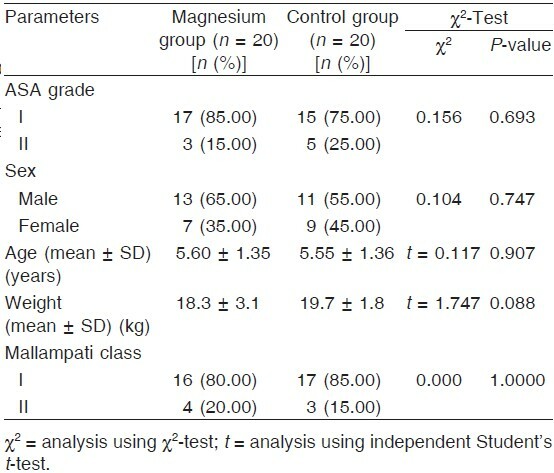 Serum magnesium increased from 1.92 to 3.18 mg/dl in the magnesium group, but with no signs of hypermagnesemia. Adding magnesium sulphate to propofol and fentanyl improves intubating conditions without the use of muscle relaxants during the start of procedures in paediatrics. As venous cannulation in children has become easier, the interest in TIVA for children has increased. TIVA can be used successfully for diagnostic and short therapeutic procedures such as ENT and ophthalmic surgery. There is no evidence of agitation or behavioural disorders with the use of propofol in paediatrics . In recent years, several changes have occurred that reduced the need for muscle relaxants during paediatric anaesthesia, such as the introduction of less toxic, shorter-acting anaesthetic drugs such as propofol and sevoflurane . This technique may be one of the choices for the anaesthetist when the use of neuromuscular blocking drug is undesirable, avoiding the serious and unwanted side effects of succinyl choline, and the less common ones of nondepolarizing drugs, such as anaphylaxis, and residual muscle paralysis or contraindications, such as myopathy . In paediatrics, tracheal intubation was usually performed under deep inhalational anaesthesia, but it has been demonstrated that a combination of propofol with opioids facilitates tracheal intubation [4,5]. Various adjuvants have been used to improve intubating conditions, such as lidocaine, midazolam, and recently magnesium sulphate, which was used in adults . Magnesium is the fourth most abundant cation in the body and plays an important role in many physiological processes. Magnesium decreases the amount of acetylcholine released from the motor nerve terminal, leading to diminished excitability of the muscle fibre itself and reduction in the amplitude of the end-plate potential, and thus it potentiates the neuromuscular blockade produced by nondepolarizing neuromuscular blocking agents. It also decreases the pressor response to laryngoscopy and intubation by decreasing catecholamine release . The aim of the present study was to assess the effect of magnesium sulphate on intubating conditions after induction of anaesthesia without using a muscle relaxant. This prospective randomized, double-blinded, controlled study was conducted following approval of Ain-Shams University Hospitals ethical committee and after obtaining parental written informed consent. A total of 40 paediatric school-aged patients between ages of 4 and 12 years, ASA I-II undergoing elective short urogenital surgeries (30-45 min) under general anaesthesia, were enrolled in the study. Exclusion criteria included ASA III and IV, any known allergy to magnesium sulphate or any other study drugs, and patients with possibility of regurgitation. Preoperative evaluation of the airway was performed, and Mallampati score was assessed. Oral midazolam was administered as premedication in a dose of 0.5 mg/kg, 1/2 h before admission to the operating room. Standard monitoring of ECG, heart rate (HR), oxygen saturation, capnography and noninvasive blood pressure was started. An intravenous line was secured with a 22-G cannula. The patients were randomly allocated randomly to one of two groups, using numbered sealed envelopes. The magnesium group (group A, n = 20) received a 5-min infusion of magnesium sulphate (30 mg/kg) in 0.9% saline 5 ml/kg. The control group (group B, n = 20) received a 5 min infusion of the same volume of 0.9% saline before admission to the operating room. Solutions were prepared by a physician not involved in the patients' care. At the end of the infusion of the study solution, anaesthesia was induced with fentanyl (1 μg/kg) followed by propofol (2.5 mg/kg) 3 min later. Injections were prepared in 20-30 s. When consciousness was lost, the ease of ventilation was assessed using a face mask as easy, difficult or impossible. Laryngoscopy was performed 60 s after propofol injection using Macintosh blade of appropriate size. The anaesthetist blinded to the group assignment performed and scored laryngoscopy and tracheal intubation. Appropriate size tracheal tubes were used according to the age. Anaesthesia was maintained with 1% isoflurane and 100% oxygen. Spontaneous ventilation with no muscle relaxant. The view of the larynx was assessed using the modified Cormack and Lehane classification . We evaluated intubating conditions using the Copenhagen score, which includes ease of laryngoscopy, position and movements of the vocal cords, and reaction to intubation (diaphragmatic movement/coughing) . Laryngoscopy was considered as easy (jaw relaxed, no resistance to laryngoscopy blade), fair (jaw not fully relaxed, slight resistance to blade) or difficult (poor jaw relaxation, active resistance of the patient to laryngoscopy). Intubating conditions were classified as excellent (all qualities were excellent), good (all qualities were either good or excellent) and poor (the presence of single quality listed under poor). Excellent or good intubating conditions were regarded as clinically acceptable; poor intubating conditions were regarded as clinically unacceptable . The duration of laryngoscopy was also recorded (the time from the start of laryngoscopy until tracheal intubation, and removal of the laryngoscope blade from the mouth). If at least one unacceptable condition was present on intubation, cisatracurium (0.15 mg/kg) was administered. Mean arterial pressure (MAP) and HR were recorded at five predetermined times: T 1 at baseline; T 2 , after infusion of the study drug; T 3 , after induction of anaesthesia, T 4 , immediately after tracheal intubation; and T 5 , 5 min after tracheal intubation. Ephedrine (0.2 mg/kg) was administered if MAP decreased by more than 30% of baseline, and atropine (0.01 mg/kg) was given if HR was less than 50 beats/min. Respiratory rate and O 2 saturation were assessed. Adverse events such as laryngospasm or bronchospasm were recorded. Serum magnesium was assessed preoperatively and 15 min after infusion. Modified Aldrete score was assessed after recovery. Sample size calculation : Sample size was calculated to be 17 after calculating an α-error of 0.05 and β-error of 0.1. Therefore, 20 patients were allocated per group to accommodate for dropouts. Data were analysed using Statistical Program for Social Science (SPSS) version 18.0. Quantitative data were expressed as mean ± SD. Qualitative data were expressed as frequency and percentage. The following tests were carried out: independent samples Student's t-test was used when comparing between two means; χ2 -test was used to compare between two qualitative parameters. P-value less than 0.05 is considered significant, whereas P-value greater than 0.05 is considered nonsignificant. A total of 40 patients were enrolled and randomized with their demographic data, shown in [Table 1], together with their Mallampati class, which was comparable in the two groups. Mask ventilation was easy in all patients. Laryngoscopy was easy in 85% of the patients in the magnesium group compared with 50% in the control group. Of the patients in the magnesium group, 85% had an optimal position of the vocal cords compared with 45% in the control group. A higher percentage of patients in the control group had diaphragmatic movement after intubation compared with the magnesium group (25 vs. 10%). 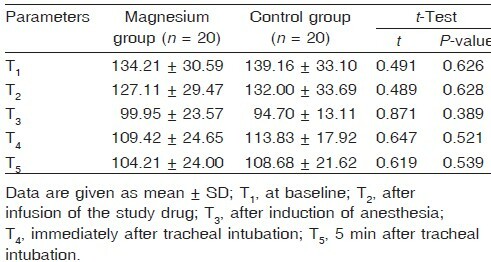 Therefore, according to the Copenhagen consensus conferences scoring system, the number of patients presenting excellent or good intubating conditions was significantly higher in the magnesium group, thus showing clinically acceptable conditions for 90% of the patients in the magnesium group in comparison with 60% in the control group [Table 2]. Patients in the magnesium group had significantly lower Cormack and Lehane score than those in the control group. Regarding the haemodynamic variables, the MAP and HR values were comparable in the two groups; in addition, O 2 saturation, EtCO 2 and respiratory rate parameters showed no significant difference. Laryngospasm occurred in three patients in the control group, whereas no bronchospasm occurred in the magnesium group. Failure of intubation was recorded in two patients in the magnesium group compared with eight patients in the control group, and thus atracurium was administered. These patients were excluded from the study. The duration of intubation was significantly shorter in the magnesium group (22 ± 5.5 vs. 25 ± 8.5). Serum magnesium level was measured preoperatively and, after injection of magnesium by 15 min, it was found to rise from 1.92 to 3.18 mg/dl, with no evidence of hypermagnesemia (bradycardia, delayed ankle jerk reflex, respiratory depression, oliguria or delayed recovery). Modified Aldrete score showed no significant difference between the two groups. Tracheal intubation during deep inhalational anaesthesia has been practised since the discovery of anaesthesia, and it is now reserved for children and in patients with suspected airway obstruction. However, the interest in TIVA for children has recently increased and become an alternative to volatile anaesthesia for preschool and school-aged children, especially for diagnostic and therapeutic procedures, as there is no evidence of agitation or other behavioural disorders after TIVA with propofol and the recovery time is short. Single-dose propofol without narcotic use has been described for tracheal intubation but intubating conditions were infusion to those achieved when fentanyl was given . In addition, there have been concerns about the safety of succinyl choline in children, as there were numerous problems associated with its use, including dysrhythmias, hyperkalemia, Masseter spasm, prolonged neuromuscular block and malignant hyperpyrexia . The mechanism of the action of magnesium as an adjuvant to intravenous induction is multifactorial. It activates many of the enzyme systems involved in energy metabolism. Magnesium is an agent with analgesic, anaesthetic and muscle relaxant effects . Magnesium has been extensively used prophylactically for terminating seizures in eclamptic patients and it has been used in treatment of ventricular anhythmias . It has been demonstrated previously that the use of magnesium sulphate with propofol not only leads to more rapid induction of anaesthesia  but also decreases the propofol infusion requirements . This study describes a successful technique for intubation without the use of neuromuscular blocking agents under general anaesthesia using magnesium sulphate (30 mg/kg) in paediatric patients. This technique offers an alternative when neuromuscular blocking agents are either contraindicated or undesirable. 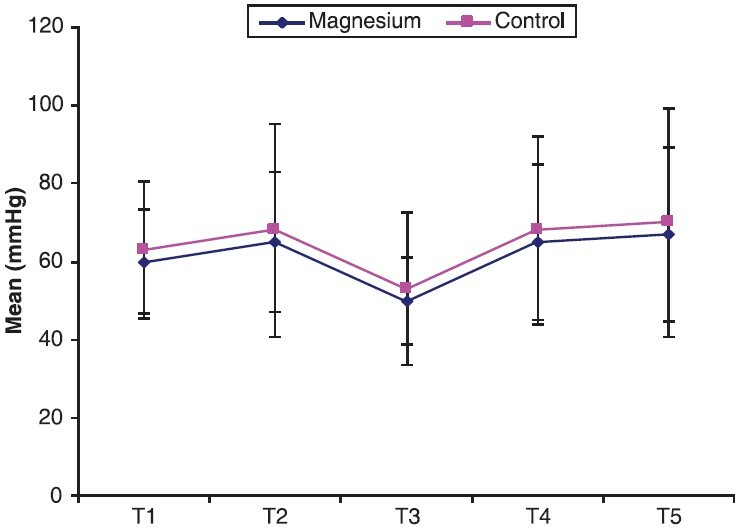 In our study, the effect of magnesium sulphate on the neuromuscular junction could explain the improvement of intubating conditions, as it alters the neuromuscular transmission by decreasing the release of acetylcholine at motor nerve terminals ; it is also known that magnesium sulphate potentiates the effect of nondepolarizing neuromuscular blocking agents . Recently, a clinical study demonstrated that 10 min infusion of 45 mg/kg of magnesium sulphate can be used as an adjuvant to tracheal intubation without muscle relaxation in adult healthy patients . It has also been demonstrated previously that rapid infusion of magnesium sulphate (50 mg/kg) can re-establish a relevant degree of muscle paralysis in patients who just recovered from muscle relaxant agents . In this study, the decrease in MAP and HR was comparable in both groups; whereas in a study conducted by Puri and colleagues, MAP decreased by 17% after administration of 40 mg/kg of magnesium sulphate, producing significant peripheral vasodilatory effect. This could be explained by the infusion time of magnesium sulphate (5 vs. 1 min) in the study by Puri et al. by the difference in the dose of magnesium sulphate (30 mg/kg in our study), and also by type of patients (paediatric patients in our study). The dose of magnesium sulphate in our study (30 mg/kg) was chosen because of previous trials, in which magnesium was investigated as an adjuvant during general anaesthesia . The magnesium level was measured in our study, revealing the increase in serum magnesium levels from 1.92 to 3.18 mg/dl; however, we found no incidence of respiratory depression, oliguria, delayed ankle jerk reflex, bradycardia or delayed recovery. Urinary excretion of magnesium in very rapid and hypermagnesemia does not occur unless venal dysfunction is present. Fuchs et al. concluded that plasma magnesium concentration increased from 0.9 to 1.08 mmol/l 15 min after magnesium sulphate (40 mg/kg) infusion. Other studies demonstrated that magnesium infusion was well tolerated, with no signs of muscle weakness [14,19]. Some authors argue that the price of omitting neuromuscular blocking agents is high in terms of poor intubating conditions, difficult airway and laryngeal injuries . Other studies confirm that intubation without a muscle relaxant increases adverse haemodynamic events [21,22]. Therefore, this technique should not be used routinely but instead should be used in a select group of paediatric patients, such as those with myasthenia gravis requiring thymectomy. There are some surgical procedures where paralysis is undesirable as ENT, neurosurgical and thyroid surgeries  ([Figure 1], [Figure 2], [Figure 3] and [Table 3], [Table 4], [Table 5], [Table 6]). Figure 1: Showing heart rate during study period. Data are given as mean SD; T1, at baseline, T2, after infusion of the study drug, T3, after induction of anaesthesia, T4, immediately after tracheal intubation and T5, 5 min after tracheal intubatio n.
Figure 2: Showing systolic blood pressur e.
Figure 3: Showing diastolic blood pressur e.
Magnesium sulphate is considered an effective adjuvant to tracheal intubation with the use of muscle relaxants in paediatric patients. Its addition to fentanyl and propofol in a dose of 30 mg/kg improve intubating conditions in 85% of patients, with no adverse haemodynamic effect. 1. Strauss JM, Giest J. Total intravenous anesthesia on the way to standard practice in pediatrics. Anaesthesist 2003; 52:763-777. 2. Meakin G. Role of muscle relaxants in pediatric anesthesia. Curr Opin Anaesthesiol 2007; 20:227-231. 3. Woods AW, Allam S. Tracheal intubation without the use of neuromuscular blocking agents. Br J Anaesth 2005; 94:150-158. 4. Stevens JB, Wheatley L. Tracheal intubation in ambulatory surgery patients using remifentanil and propofol without muscle relaxants. Anesth Analg 1998; 86:45-49. 5. Scheller MS, Zornow MH, Saidman LJ. Tracheal intubation without the use of muscle relaxants: a technique using propofol and varying doses of alfentanil. Anesth Analg 1992; 75:788-793. 6. Erhan E, Ugur G, Alper I, et al. Tracheal intubation without muscle relaxants: remifentanil or al fentanil in combination with propofol. Eur J Anaesthesiol 2003; 20:37-43. 7. Gupta K, Vohra V, Sood J. The role of magnesium as an adjuvant during general anesthesia. Anaesthesia 2006; 61:1058-1063. 8. Cormack RS, Lehane J. Difficult tracheal intubation in obstetrics. Anaesthesia 1984; 39:1105-1111. 9. Fuchs-Buder T, Claudius C, Skovgaard LT, et al. 8th international Neuromuscular Meeting Good clinical research practice in pharmacodynamic studies of neuromuscular blocking agents II: the Stockholm revision. Acta Anaesthesiol Scand 2007; 51:789-808. 10. Tsuda A, Yasumoto S, Akazawa T, Nakahara T. Tracheal intubation without muscle relaxants using propofol and varying doses of fentanyl [article in Japanese]. Masui 2001; 50:1129-1132. 11. Goudsouzian NG. Muscle relaxants in children. In: Cote CJ, Todres D Goudsouzian NG, Ryan JF, editors. A practice of anesthesia for infants and children. Philadelphia: Saunders; 2001. 196-215. 12. Dubé L, Granry JC. The therapeutic use of magnesium in anesthesiology, intensive care and emergency medicine: a review. Can J Anaesth 2003; 50:732-746. 13. James MFM. Clinical use of magnesium infusion in anesthesia. Anesth Analg 1992; 74:129-136. 14. Schulz-Stubner S, Wettman G, Reyle-Hahn SM, et al. Magnesium as part of balanced anesthesia with propofol, remifentanil and mivacurium: a double blind, randomized prospective study in 50 patients. Eur J Anaesthesiol 2001; 18:723-729. 15. Pinard AM, Donati F, Martineau R, et al. 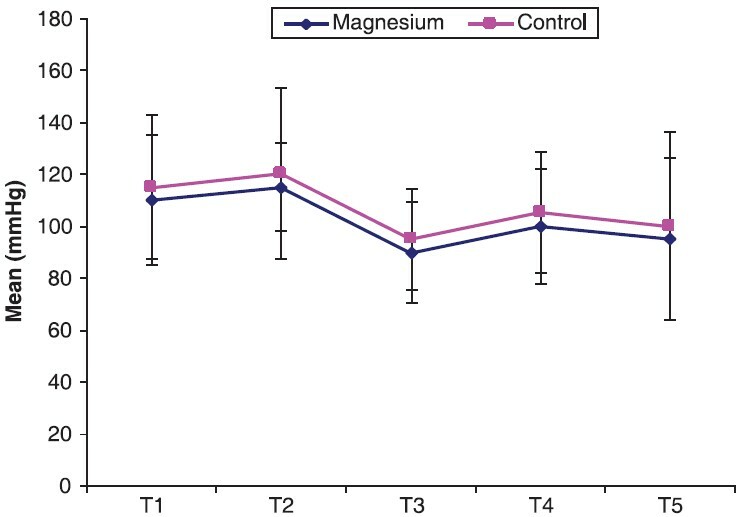 Magnesium potentiates neuromuscular blockade with cis atracurium during cardiac surgery. Can J Anaesth 2003; 50:172-178. 16. Aissaoyi Y, Qamous Y, Serghini I, et al. Magnesium sulphate: an adjuvant to tracheal intubation without muscle relaxation - a randomized study. Eur J Anaesthesiol 2012; 29:391-397. 17. Hans GA, Bosenge B, Bonhomme VL, et al. Intravenous magnesium re-establishes neuromuscular block after spontaneous recovery from on intubating dose of rocuronium: a randomized controlled trial. Eur J Anaesthesiol 2012; 29:95-99. 18. Puri GD, Marudhachalam KS, Chari P, Suri RK. 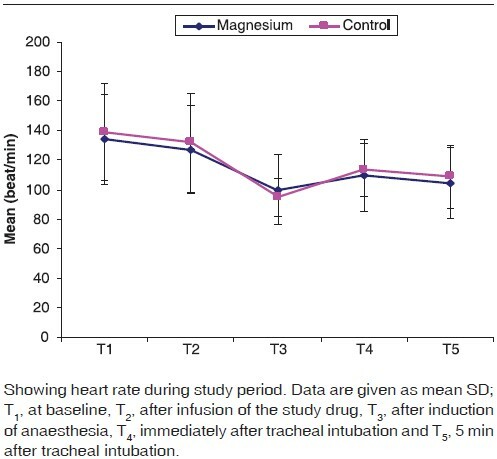 The effect of magnesium sulphate on hemodynamics and its efficacy in attenuating the response to endotracheal intubation in patients with coronary artery disease. Anesth Analg 1998; 87:808-811. 19. Telci L, Esent F, Erdon T, et al. Evaluation of effects of magnesium sulphate in reducing intraoperative anaesthetic requirement. Br J Anesth 2002; 89:594-598. 20. Sneyd JR, O'sullivan E. Tracheal intubation without neuromuscular blocking agents: is there any point? Br J Anaesth 2010; 104:535-537. 21. Grant S, Noble S, Woods A, et al. Assessment of intubating conditions in adults after induction with propofol and varying doses of remifentanil. Br J Anaesth 1998; 81:540-543. 22. Trabold F, Casetta M, Duranteau J, et al. Propofol and remifentanil for intubation without muscle relaxant: the effect of the order of injection. Acta Anaesthesiol Scand 2004; 48:35-39.